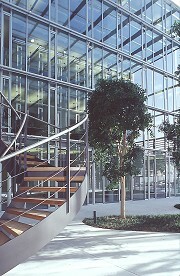 The new administration of Public Services Düsseldorf was erected on the site of an old industrial fallow. Four parallel new buildings were added to the heart of the 19th Century industrial site and its machine shop. The machine shop, which now hosts the representative entrance and exhibition hall, and the other buildings are connected with spacious and fully glazed atriums. The true intention of this composition is only disclosed at second glance: on the site of the new atriums there were pieces of historic machinery left which now serve as impressive museum objects. This solution saved them from demolition. In autumn 2000 the architecture office Mescherowski was hired from Ingenhoven, Overdieck, Kahlen & Partner to do the implementation planning of this project. It was my task as freelance architect for Mescherowski to create the working drawings of all necessary metalwork details.